We had a dozen happy explorers at Maple Flats on Sunday afternoon, September 7, including two new guests and two family members of a Master Naturalist. 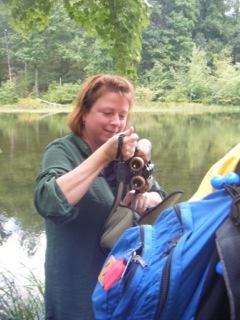 We had our dragonfly experience at the first false pond, and hiked past the second one (nearly dry at this time). Edie Kretsch introduced us to dragonfly behaviors and sounds, and we saw several species of the 55 possible ones that live there. (Some of them live nowhere else!) Several females were laying eggs in the water, there was a mating pair that nearly crashed into us. Lovely pale blue, deep red, clear-winged and golden dragonflies and several different damselflies. Edie used an iPad to help with identification and close ups. Eric Jones led a relaxed and informative hike, focusing on the fall flora around us, along with some history and lore of the sinkhole ponds. 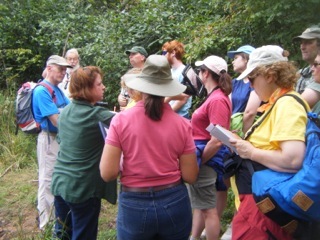 This was a great refresher on tree identification, fall wildflowers, and some ancient plants – lichens and fungi. Eric also showed us some of the natural sinkhole ponds, and gave us more detailed directions for getting to Green Pond and Spring Pond, deeper into the forest. Bikes would be great for this! The variety of ponds and species found in them, their seasonal fluctuations and life cycles would make for endless observation and exploration. Since so much research has been done on these, some understanding of this area might help us if we were to work on the ponds behind Grottoes for a focus project. Tom and Jenna Benzing (Janet James’ family) were frog magnets – finding at least four different species, another aspect of the sinkhole ponds. 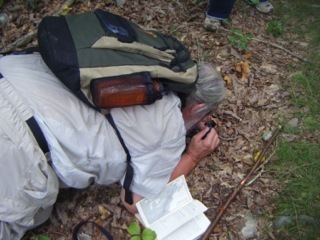 This trip was an important entree into the areas of the George Washington/Jefferson National Forest along the Coal Road, and we Master Naturalists gained some confidence about more exploring there! September 29, 2014 in Projects.